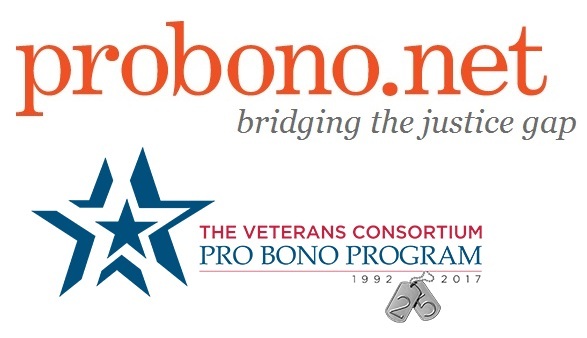 WASHINGTON - March 9, 2017 - PRLog -- The Veterans Consortium Pro Bono Program and Pro Bono Net are pleased to announce the launch of a new website,www.vetsprobono.org, to support and engage both veterans and volunteer attorneys. The new site leverages the probono.net technology platform, which is used to support broad-based networks of legal aid, civil rights and pro bono lawyers across the country. The site offers veterans and their families information about appealing unfavorable VA benefits decisions, including informational videos and frequently asked questions. The new web platform delivers a winning "trifecta" solution: making it easier for veterans to file federal court appeals, making it more efficient for attorneys to volunteer and ask for cases to represent veterans in need, and making it more effective for The Veterans Consortium (TVC) staff attorneys to carefully match the right client with the best volunteer. The Consortium's volunteers will be able to find available pro bono cases, as well as have the ability to indicate their interest in specific cases. To support their representation of veterans, the site also provides volunteers a library of resources on a wide variety of veterans' issues. In addition, TVC will soon launch an interactive interview to generate an informal brief hosted on Pro Bono Net's LawHelp Interactive (LHI's) platform. The brief was designed for veterans who are appealing benefit denials in the U.S. Court of Appeals for Veterans Claims. Through LHI and its Connect feature, appellants respond to questions with an easy-to-use interface and then are able to share their drafts with TVC staff for review before filing them with the Court. "This partnership between Pro Bono Net and The Veterans Consortium demonstrates an ideal use of online tools and expertise to support a truly national network of volunteers to serve veterans across the country," says Mark O'Brien, Executive Director of Pro Bono Net. The Veterans Consortium and Pro Bono Net also teamed with Neota Logic and Just-Tech, LLC to build and integrate the tools needed to make this technology initiative a reality. Ed Glabus, Executive Director of The Veterans Consortium, summed up the project in these words: "This new web platform is a leap ahead for our staff and dedicated volunteers, and helps us live our credo that our veterans in need, our nation's defenders, deserve the benefits and compensation they were promised, and the best legal services free of charge, to meet their challenges. We couldn't have accomplished this rapid increase in capability and capacity without our outstanding high tech and mission driven partner Pro Bono Net." Pro Bono Net is a national non-profit organization dedicated to increasing access to justice for the disadvantaged. Through innovative technology solutions and expertise in building and mobilizing justice networks, Pro Bono Net transforms the way legal help reaches the underserved. Comprehensive programs including www.probono.net, www.lawhelp.org and www.lawhelpinteractive.org, enable legal advocates to make a stronger impact, increase volunteer participation, and empower the public with resources and self-help tools to improve their lives. For additional information visit: www.probono.net. The Veterans Consortium is the leading national 501c(3) charity providing free legal counsel in federal matters to qualified veterans, their families, caregivers and survivors worldwide since 1992. For additional information about The Veterans Consortium and our various outreach initiatives, visit: www.vetsprobono.org or contact: Maureen Thomas, Deputy Director for Outreach and Communications, The Veterans Consortium at: maureen.thomas@vetsprobono.org.